Cave Diver Course | What does it take to become a TDI Full Cave Diver? What does it take to become a TDI Full Cave Diver? This course is intended for divers wanting to cross from recreational to technical diving. Scuba Diving with redundant, self-sufficient gas sources aka scuba tanks, mounted on the sides of the diver rather than on the back. The Cavern Diver course is the first step towards the Full Cave Diver certification and is probably the most challenging of all. It is here where the diver learns all the essential emergency handling protocols for overhead environments diving. 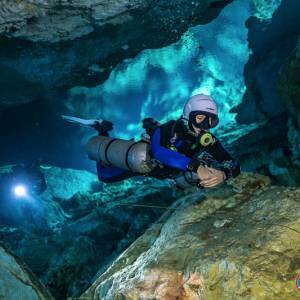 This course introduces the basic principles of cave diving using a single guideline. It is the second step towards becoming a Full Cave diver and further develops techniques, building directly upon the TDI cavern diver course. The intro to cave objective is to fine tune the skills learned in the cavern diving course and to introduce the additional techniques and procedures required for simple cave diving. The course follows the same structure as the Cavern Diver course which includes, briefings and debriefings, land drills, predive drills and in water drills. At this level, the student diver must master all the skills of the Cavern course to introduce the line recovery and lost diver protocols as well as line entanglement, line cutting, and repair. This course takes a minimum of 4 days if you are Cavern Diving certified, its a minimum of 5 days when combined with the TDI Cavern Diver course. The Full Cave Diver course is the last step towards getting the freedom of safely diving in caves with the use of complex navigation techniques, planning realistic cave dives and execution of different types of cave diving scenarios. 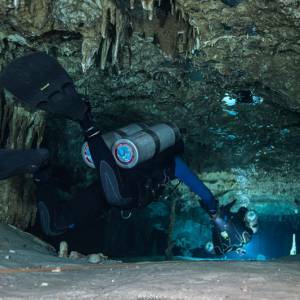 This course expands the previously learned skills and emphasizes in dive planning and skill perfection through actual cave diving penetration. During this course, the students learn about properly marking their exit lines as they encounter multiple points of navigation and learn to safely plan dives to complete simple and complex circuits and traverses. The duration of this course when taken on its own and the student has an Intro to Cave Diver certification is a minimum of 5 days. The skills learned in the Cavern and Intro to Cave course are reviewed before going into the complex navigation portion of the course. When taking the whole overhead environments course from Cavern to Full Cave in one go, its a minimum of 8 days of training. The Side Mount Diver course adds two days at the beginning of the full cave course. 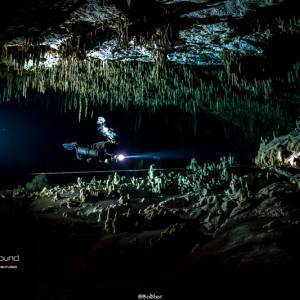 Before starting with cave diving training, the student must be a Side Mount Diver or the Side Mount course will be integrated with the Overhead Environments Diving Training.